Mini netball is a gateway activity to senior netball. This popular sport is as entertaining for spectators as it is for the young ladies who are learning how to throw a ball in its intended direction. Mini netball is a non-league activity and players are encouraged to develop a love for sport and participation rather than pursuing a ‘win at all costs’ goal. 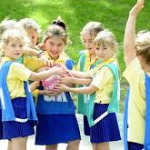 Mini netball is offered to girls in Grades 1 and 2. Mini netball practice requires players to wear the official school PT kit. Tom Newby School provides the netball skirts and bibs for the players at official tournaments and league matches. Players are required to provide their own TNS school PT shirt.